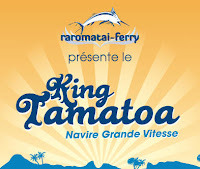 Tahiti on a Budget: The King Tamatoa ferry is running, for real. The King Tamatoa ferry is running, for real. The various news outlets reported that the King Tamatoa ferry would begin running from Tahiti to Huahine, Raiatea, and Bora Bora on March 5th. Well, that didn't happen but it did begin running on March 31st. What wonderful news! I sure hope it lasts unlike the previous ferries that have briefly run between the Society Islands (the Ono Ono, the Aremiti). Departures are from the Quai Sud opposite the GIE Tahiti Tourisme office in downtown Papeete. 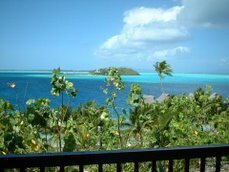 One way to Bora Bora is 10,000 cfp for VIP seats, 8,000 cfp for Comfort seats, 6000 for tourist seats. Two children under 12 are free. If you are over 60 you get a 20% discount. 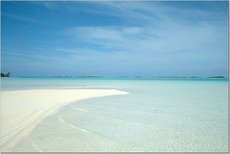 I'm planning a trip to Tahiti and Raromatai in July 2011. Do you know if this ferry will still be running then? Is it still running now. I traveled to Raromatai back in 1999 on the Onoono just months before they shut that one down. The Hawaiki Nui was much less desirable to travel on with the 24-30 hour trip. Yikes! I definitely prefer to be back on land in 6 hours. Any info you have would help. Thanks. No - it is gone!